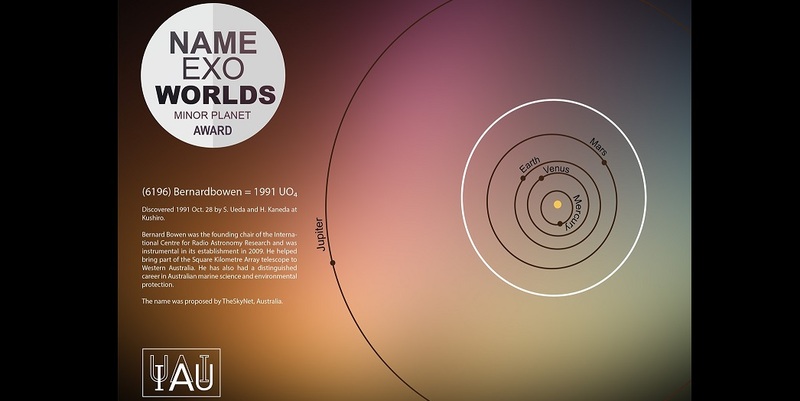 A minor planet in the Solar System will officially be known as Bernardbowen after Australian citizen science project theSkyNet won a competition to name the celestial body. The minor planet was named by the International Centre for Radio Astronomy Research (ICRAR) in honour of their founding chairman Dr Bernard Bowen. Bernardbowen sits in the asteroid belt between Mars and Jupiter and takes 3.26 Earth years to orbit the Sun. The minor planet was discovered on October 28, 1991, and until now has been known as (6196) 1991 UO4. Project founders ICRAR also won the right to name a minor planet within our Solar System. Bernardbowen was one of 17 minor planets to be christened today. Other newly named minor planets include Kagura, after a traditional Shinto theatrical dance, and Mehdia, which is equivalent to the Arabic word for gift. Dr Bowen is renowned as one of the country’s finest science administrators and has presided over scientific advances ranging from the oceans to the skies. He was instrumental in the establishment of ICRAR in 2009, and helped bring part of the Square Kilometre Array telescope to Western Australia.